As part of our comprehensive collection of superior glass and glazing products, we’re proud to offer an outstanding range of glass balustrades. All Glass and Glazing provides the North West of England with a market-leading design, manufacture and product fitting service - all from a family-owned and operated brand where the personal touch comes as standard. Glass Balustrades Blackley offer the perfect combination of enhanced safety and the most elegant of aesthetics. Designed to create robust physical barriers without obstructing views or casting shadows, our Glass Balustrades Blackley make the perfect alternative to standard barriers, banisters and fencing options. 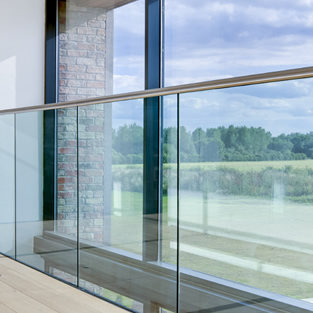 Suitable for use across residential properties, commercial buildings and larger industrial applications alike, superior-quality glass balustrades are all about that perfect balance of form and function. Elegant in design yet superbly robust in nature, glass balustrades have become the very hallmark of sophistication and practicality. We create balustrades that serve as visual enhancements in their own right, while at the same time bolstering safety and security. We’ve worked hard to build a brand where exquisite quality and unrivalled value for money come as standard with every product and service we offer. From the smallest of residential enhancements to the largest industrial-scale projects, you can count on All Glass and Glazing to deliver! Where safety and security simply cannot be compromised, second-rate balustrades are wholly unacceptable. While it’s easy to produce a glass balustrade that looks the part, actually going several steps further to guarantee outstanding strength, durability and performance takes entirely more dedication. Here at All Glass and Glazing, we put our reputation on the line every time we manufacture and supply any of our glass safety products. We also back everything we do and everything we sell with an array of quality and satisfaction guarantees. For more information on our glass balustrades or to discuss a quotation, give the All Glass and Glazing team a call today on 0161 427 7800.